This series is a Merit winner of the Society for Technical Communication’s Touchstone Award. This article is part 1 of a series written by Sovan Bin from Odaseva. This series details Odaseva and Sovan’s experiences and best-practice recommendations for anyone working with enterprise backup and restore processes. For more information about backup and recovery see part 2, part 3, and part 4 of this series. Data backup and restore is often considered a security topic. While this topic is indeed the first step to set up a disaster recovery plan, the technical challenges raised share common grounds with data migration, rollback strategy, sandbox data initialization or even continuous integration. What are the possible roadblocks? Which Salesforce API would you use? What kind of speeds can you expect? How can you accelerate the process? Why would you backup Salesforce data (including metadata)? There are two types of information you can backup from Salesforce: data and metadata. These APIs will allow you to set up either a full, incremental, or partial backup. Any local backup should be properly guarded against security risks, which might involve encryption of local data or other security measures. When choosing a backup method, keep the following factors in mind to ensure your backup data is secure. Backup raises the important question of Restore. Keep the following topics in mind when addressing this requirement. We’ll be going into more details on restore capabilities in the next article of this series. Regularly run backup solutions should be able to handle backup failures with minimal user interaction. Asynchronous solutions (for example, the Bulk API) have some basic fault tolerance built-in (automatic retries for failed records). If the following factors are important for your backup process, consider a solution that provides fault tolerance. We’ll go into more details on scalability later on in this article. Some scenarios might require the ability to change specific ways the backup process works. Using Salesforce APIs gives you fine-grain control over the entire backup process. If the following factors are important for your backup process, consider a solution that provides maximum flexibility, like using Salesforce APIs. Next, we’ll start by looking into using APIs in your backup solution. Which API should you pick? If you opt to use Salesforce APIs for your backup solution, you’ll need to choose which API to use based on your backup use case. Some APIs (such as the Bulk API) are designed for bulk operations that can be performed asynchronously, while other APIs are designed for synchronous operations. Ideally a backup should give a representation of the data at a certain point in time. However, while the backup is being performed, Salesforce data can be modified by users. The longer the backup process lasts, the more discrepancies you might get at the end of the process. Minimizing the time spent by the backup to reduce the probability of such discrepancies remains one of the best options — this is why performance is key in backing up. Have you ever wondered how fast Salesforce APIs can go? 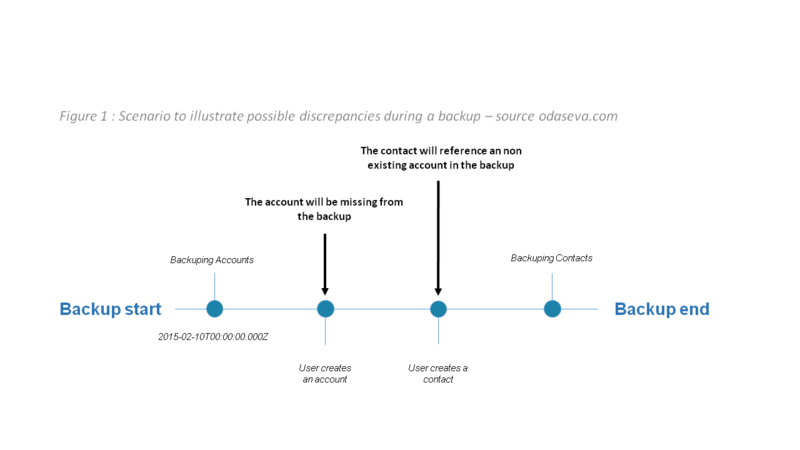 The following metrics were provided by odaseva.com, based on the backups of 12 billion records from Salesforce. The degree of parallelization has been arbitrarily set to 10 for the REST API based on my personal projects experience. Going above 10 usually does not accelerate the process or raises new challenges (i.e. org limits). Similarly, we’re showing a degree of parallelization of 35 for Bulk API based on data from my projects. Note that this degree of parallelization comes from metrics from Salesforce servers with minimal load. 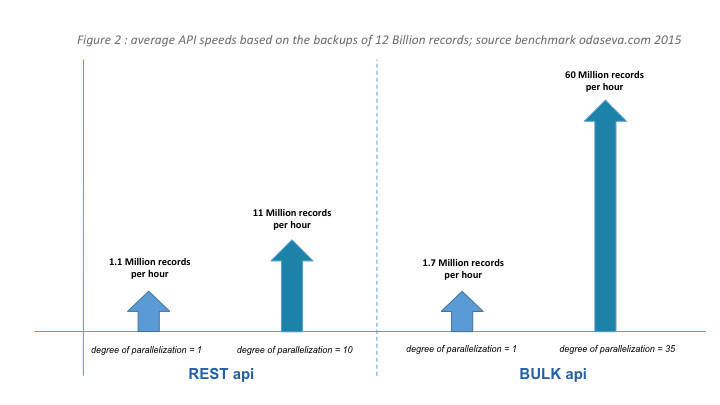 In general, when dealing with high data volumes, the Bulk API has better throughput and is more scalable than the REST API. Backup speed (data) can vary a lot depending on the number of columns of the different objects and the types of fields. A backup of 9 million records containing less than ten fields (boolean and audit fields) even reached the impressive speed of 16.5M/h per unit of parallelization, which gives a theoretical speed of 577 million records per hour with a degree of parallelization of 35. Salesforce platform definitely has one foot in the future! Backup speed regarding the files (Base64 fields) can vary a lot depending on the size of the files. It is much faster to backup one file of 2GB (~2.6GB per hour) than 2,000,000 files of 1KB (~600MB per hour). Another important part of backup performance is the capacity to retry an operation to maximize its probability of success. For example, should you encounter timeouts using the SOAP or REST API, you could retry and leverage the Bulk API. Should you encounter timeouts using the Bulk API, you could retry and leverage the Bulk PK Chunking header (Spring ‘15). Especially in the context of file/Base64 backups, defining a retry policy (failure or corruption detection, incremental/fixed interval/exponential backoff pattern) will play an important role in your backup strategy. What about Backup optimization principles? Figure 2 and the article “The Salesforce Bulk API – Maximizing Parallelism and Throughput Performance When Integrating or Loading Large Data Volumes” written by Sean Regan show how important parallelization can be to extract Large Data Volumes (LDV) and optimize a backup strategy. Parallelizing several queries is a first step. What about parallelizing a single query to accelerate the backup of the Account object for example? In either case, you will have to add the time required to merge the final results to your time estimates. This article was a gentle introduction to backing up and restoring data/metadata using Force.com APIs, and we’re just getting started. Look for the next part of this series soon and learn more about Restore. Sovan Bin is a Salesforce Certified Technical Architect and the CEO and Founder of odaseva.com, an AppExchange enterprise software provider based in both San Francisco and Paris, addressing the challenges of Salesforce data recovery (backup & restore) and release management (metadata comparison, sandbox initialization & data quality). He has been providing innovative solutions regarding Salesforce platform governance, security and performance since 2006. This post was published in conjunction with the Technical Enablement team of the Salesforce Customer-Centric Engineering group. The team’s mission is to help customers understand how to implement technically sound Salesforce solutions. Check out all of the resources that this team maintains on the Architect Core Resources page of Salesforce Developers.